This exhibition in 1914 was the biggest art event ever held in Indonesia and even included as one of the 10 World Expo’s ( World Fair). 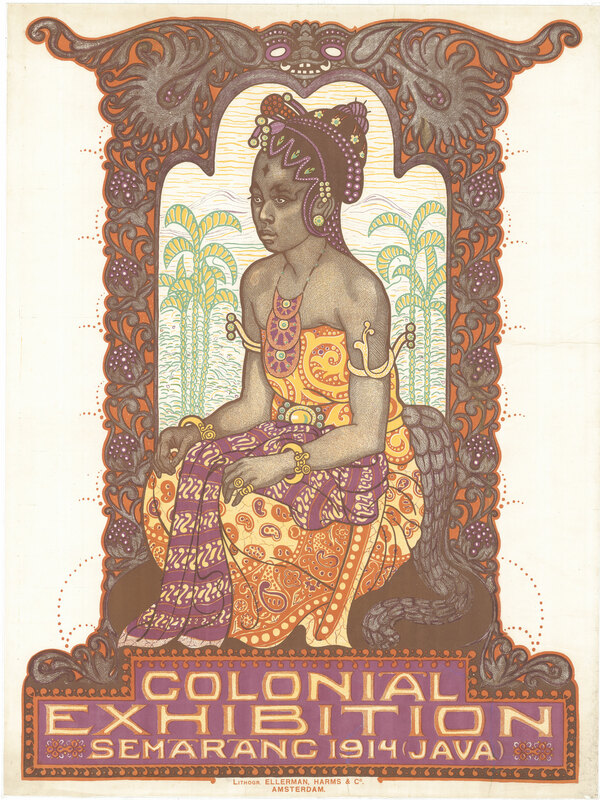 Ink on paper poster advertising the colonial exhibition in Semarang (Dutch East Indies); image depicts a Javanese bride wearing traditional costume seated under an elaborate archway set against stylised yellow palm trees in the background. Artist; Albert (Pieter) Hahn Sr. Designer; Amsterdamsche Boek & Steendrukkerij v/h Ellerman, Harms & Co Publisher Hoofdbestuur der Vereenigde Koloniale Tentoonstelling Semara Other relation. Condition: Colours more bright as in the image shown, contact us for more images. Condition; poster has been torn, professionally restored. Measures: 109.2 x 81 cm.